Are you just getting started in the world of vinyl records and turntables? You don’t have to spend hundreds of dollars on a top shelf record player to get into the game. In fact, we found a great record player for under $100. The Audio-Technica AT-LP60BK is an affordable, fully automatic belt-drive turntable that will suit most needs and it’s available on Amazon for $99. Its built-in switchable phono preamp allows you to connect directly to your computer, home stereo, powered speakers and other components that have no dedicated turntable input. 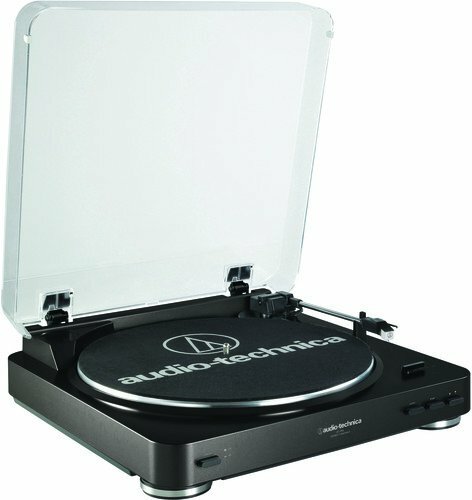 The turntable comes with an integral Audio-Technica Dual Magnet™ phono cartridge with replaceable stylus, and the prices on the stylus are affordable and should be readily available in the future. The sound on this turntable rivals more expensive $500 models.